The 2014 growing season on the Science Barge kicks off on Saturday, April 12 and goes until Saturday, November 8th. During our official season, the Science Barge is open to the public on Saturdays and Sundays between 12pm and 6pm for a suggested donation of $3 per person (free for children 10 or younger). If you would like to arrange a weekend tour for a group of ten or more there will be a fee of $125. Call or e-mail Science Barge Director Bob Walters for more information: (914) 513-7354. We are currently scheduling school and camp field trips for spring and summer (Monday-Friday)! Call 914-375-2151 if you are interested in booking a trip, or email sciencebarge@groundworkhv.org. Bob Walters, the Director of The Science Barge, holds open volunteer hours every Sunday, 10am-12pm. Just show up or contact Bob at 914-513-7354 or e-mail bob@groundworkhv.org for more information about volunteering. 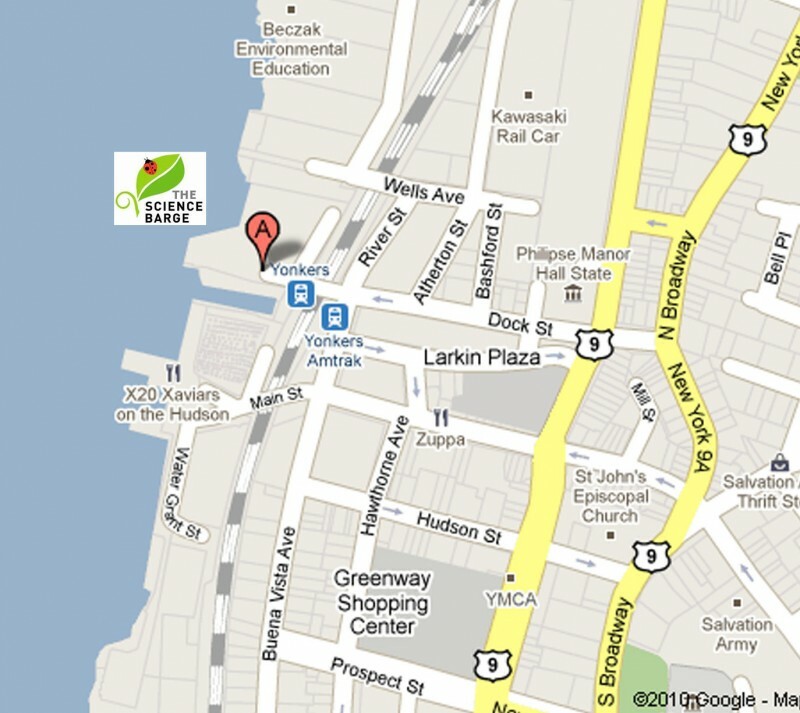 We are located on the Hudson River, just North of the Yonkers Pier. For directions, search 99 Dock St. Yonkers, NY 10701. Metered parking is available. The Barge is easily accessible from the Metro North Hudson line. Get off at the Yonkers stop. You can see the Barge from the train platform! Are you a teacher bringing a class to the Barge? Download Instructions for Bus Drivers. The Science Barge is now offering Fun Weekend Workshops for Kids! Every Sunday from 2-3:30 pm we will lead hands-on activities for children 5-10 years old. $5 per child ($3 for Yonkers residents) 1/2 off for families with 3 children or more. 7/25: Compost Connection: Meet the Barge’s worms and build …your own worm bin in a bottle! 8/1: Healthy Kids, Healthy Planet: Come help harvest, prepare and eat a summer salad fresh from the greenhouse. Also prepare a Science Barge Salad Dressing. 8/8: What a Watery World: Build your own weather system in a terrarium to take home.